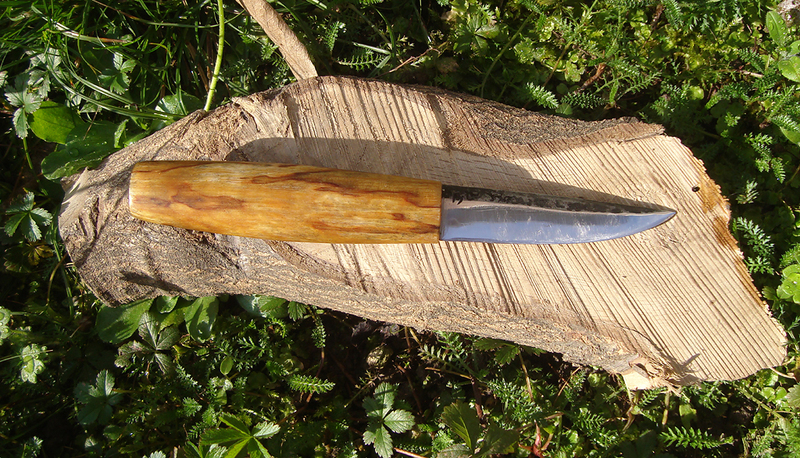 This puukko was made by Ilkka Seikku, native of Ulvila, but now living and working in Sastamala, 50 km west of Tampere. 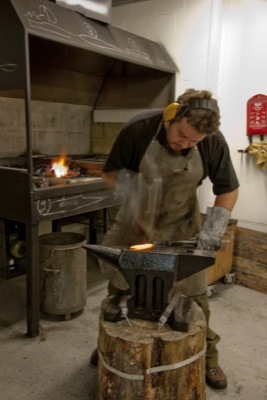 He’s a full time blacksmith, old style craftsman and wilderness guide. He has recently dropped the use of electric tools for the crafting of traditional knives, while keeping their use when making full-tang bushcraft knives. A fundamentalist conservator of old traditions and willing to preserve them for the generations to come, he aims to craft tough and effective tools. “Performance” is the key word, everything else comes after. Also a booster of materials recycling, he forges puukko blades, fire steel strikers etc from old files. All the measurements I’ll give are just of this specimen, since every puukko is individually made measures will change slightly. 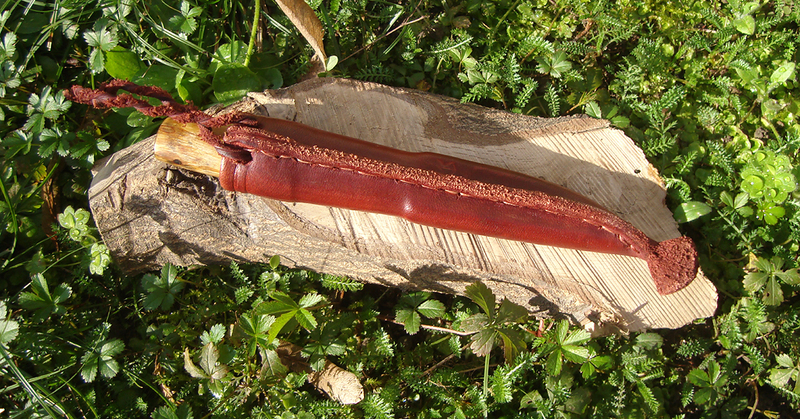 This puukko was completely made without power tools. Following the oldest tradition the blade was forged with a hand held hammer, recycling an old file, into the Finnish trademark rhombic section. Out of the box it wasn’t hair popping sharp, but plenty sharp for woodworking. I personally don’t keep woodworking puukkos shaving sharp, as it wouldn’t last on seasoned wood. It’s also worth knowing that Ilkka hand sharpens all his puukkos with a slate wetstone and this was no exception. As for all Ilkka’s knives the heat treatment was made completely on the open fire of the charcoal forge, following the steel colour changing. 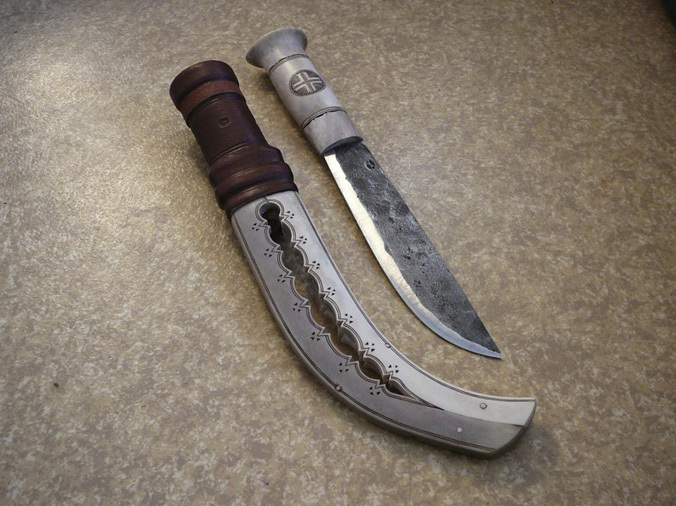 Blades first get a quick water quenching followed by a longer partial oil quenching and by two temperings. Water quenching makes the sharpest edge, while oil gives added strength. 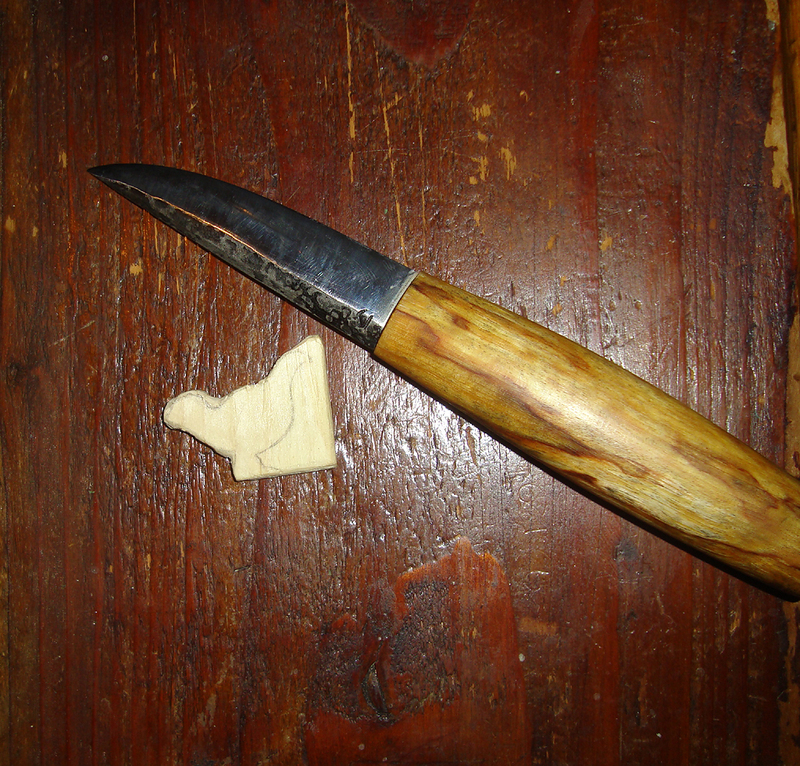 As for old time maasepän puukkos, the handle is nailed into the sharp end of the tang. 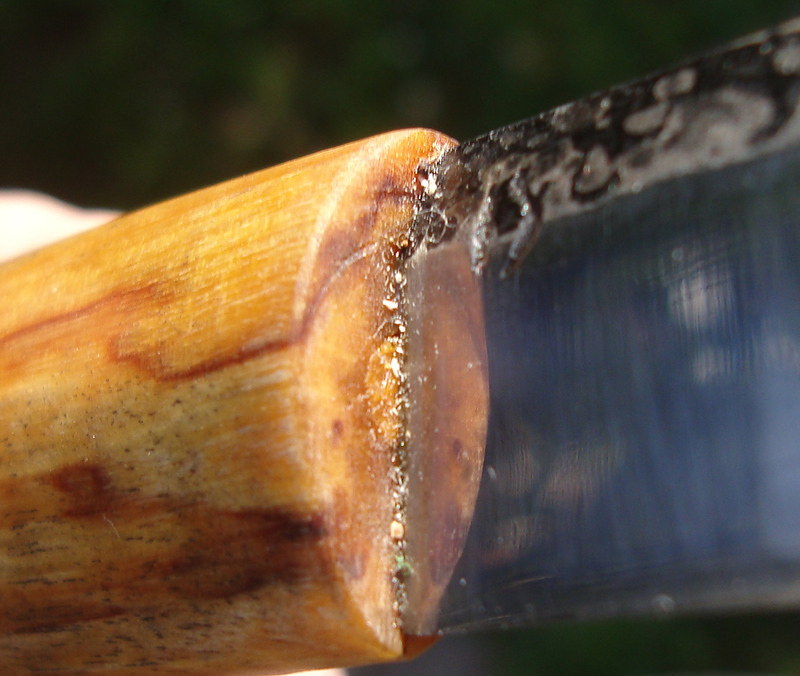 The blade-handle junction shows an old trick to increase sturdiness in the construction and to keep the tang tight: two small wedges at the sides of the blade. 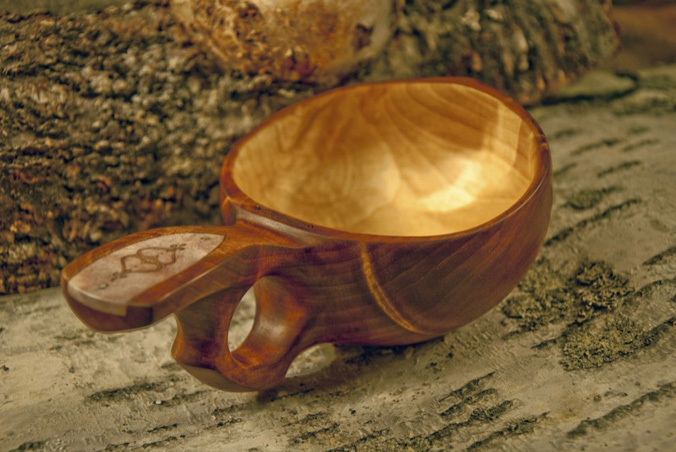 The handle is made of a single piece of spalted birch. Spalted woods were attacked by fungi and show characteristic wavy patterns, often reddish or greenish. Ilkka didn’t sand it to a very fine grit, to allow a good grip, but took away every bit of roughness. The handle has a slim, flattened, oval section, perfect for the knife size, but not abundant by any means. Even if rather tiny it fills good a mid sized hand. 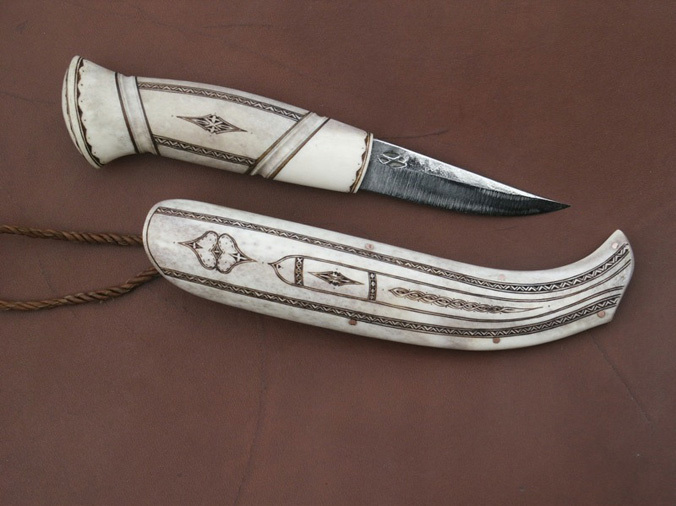 The sheath was hand stitched on the back from 2 mm thick cowhide and the leather of the mouth is folded inside so to increase the friction retention. 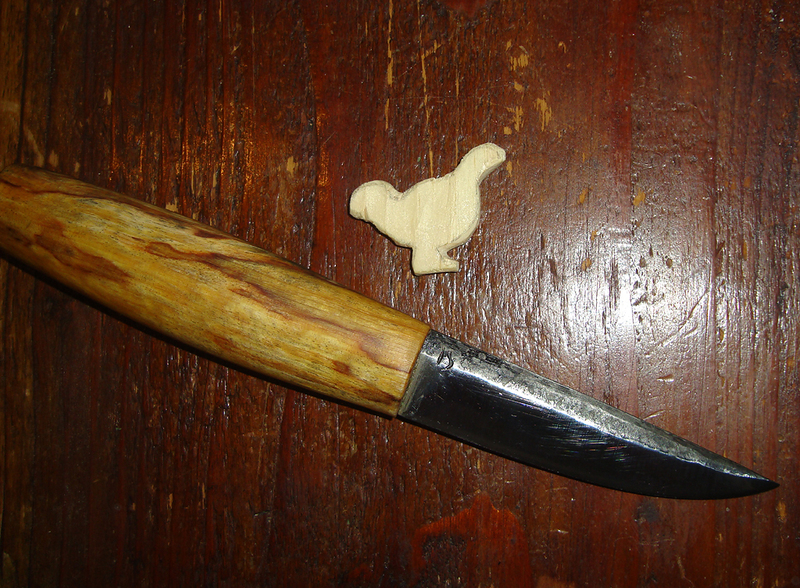 Inside there is a two sided protective liner, carved with this same puukko. The side facing outside is made of spruce for good moisture dissipation, while the side facing the user’s hip is made of birch to give solidness to the structure. The belt loop is made with a twisted leather string, closed with a knot, attached to the sheath with two holes made at the sides of the seam. 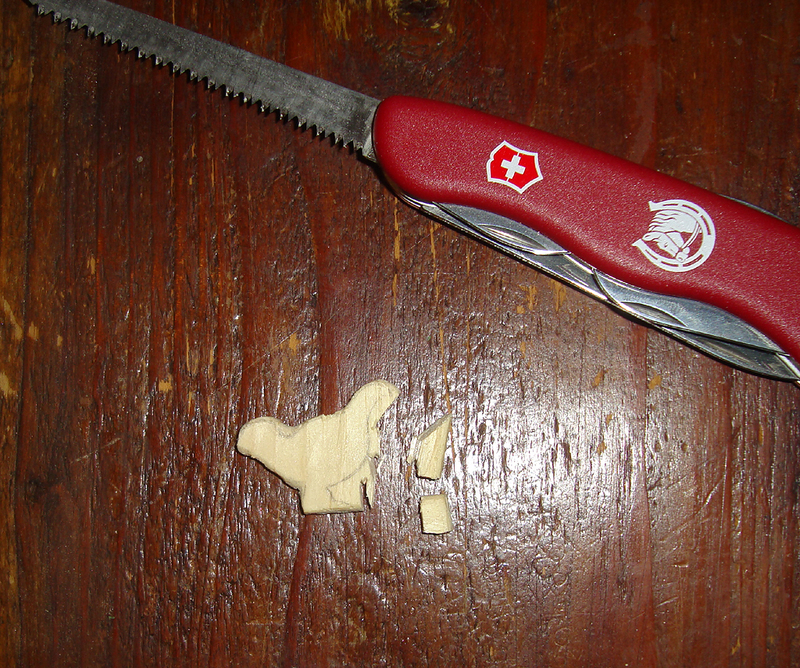 Due to its slim constitution and small proportion it’s devoted to pure whittling. Even though very light it feels bit heavier than what it actually is. 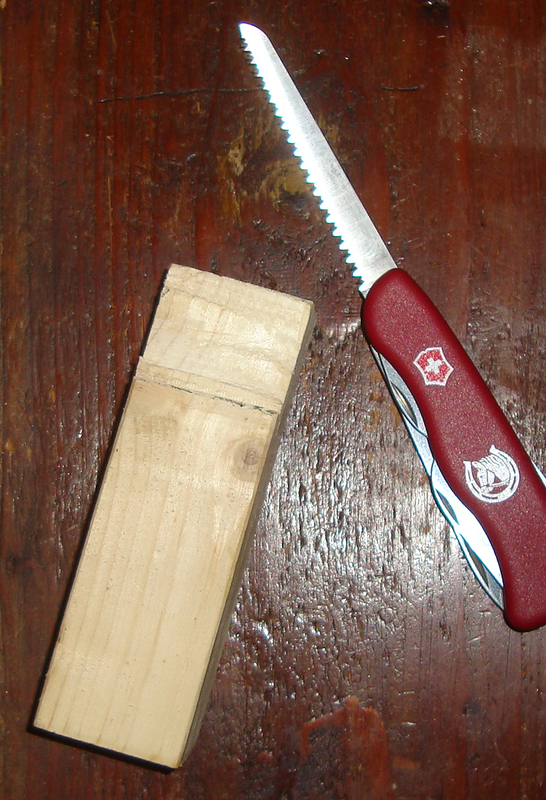 Just to explain its lightness this is a real “phantom puukko” on the belt, a puukko that weights like an Opinel n°8. The belt loop braided next to the mouth gives steadiness during walking, but leaves also the sheath the agility to move away easily when needed. 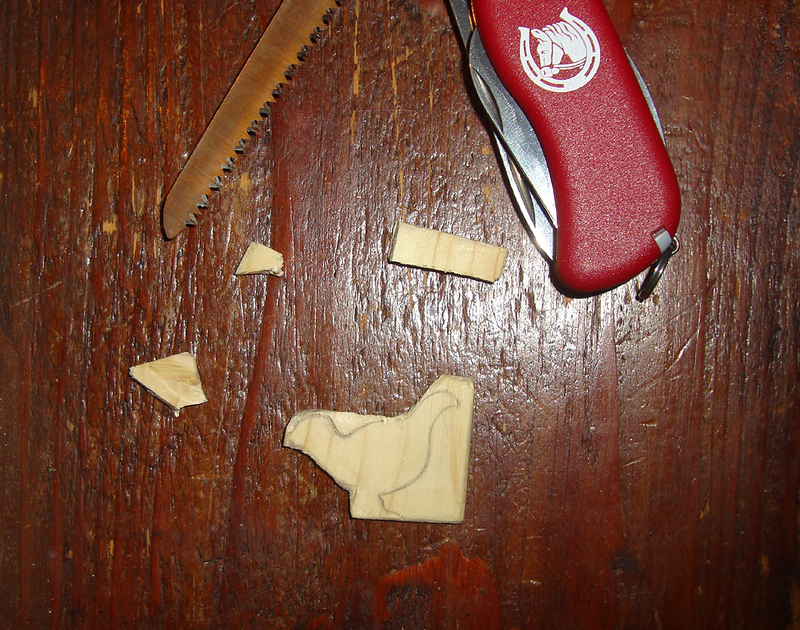 I don’t like carving on green wood for two reasons: it’s useless to harm a sentient living being just for the fun of some wood working and, moreover, you can’t really understand edge holding and durability just by cutting fresh wood. 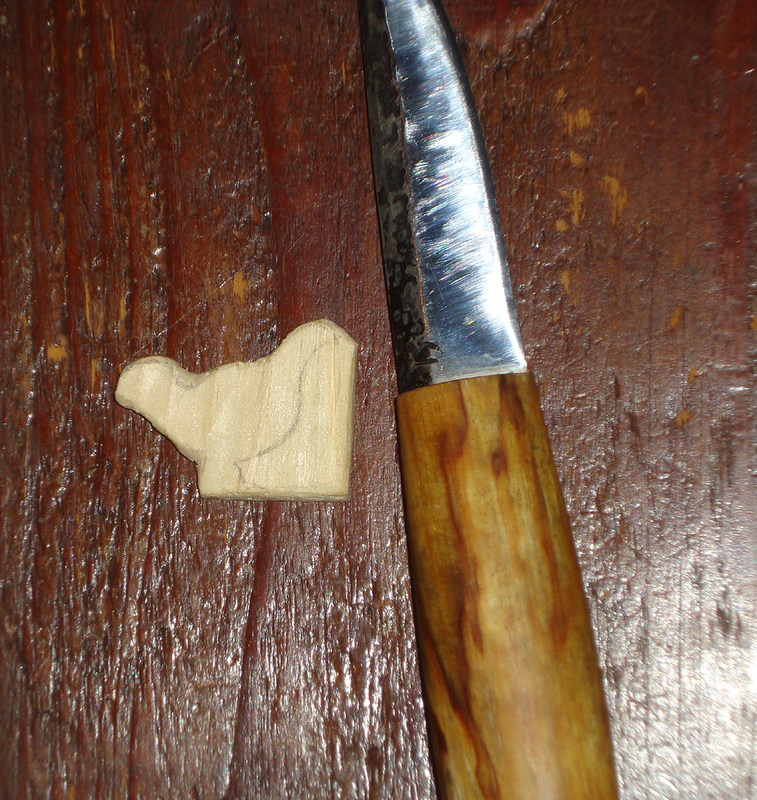 So, let’s see how the puukko holds up carving dry wood. I took piece of oak that had seasoned for four years with fibers perpendicular to the future whittling direction. 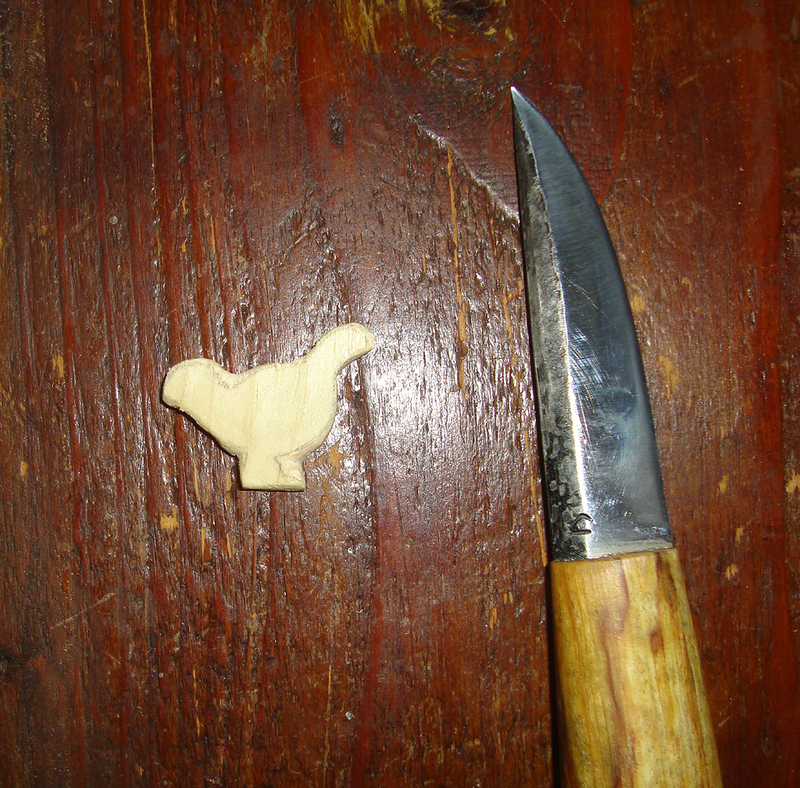 I sawed off a 40x35x5 mm piece with the saw of a Vixtoinox Equestrian and smoothed the oak piece with the puukko. Then I drew a willow grouse silhouette, Ilkka is a ptarmigam bow hunter, and sawed off the exceeding material near the tail, the back of the tarsiers and the rump. 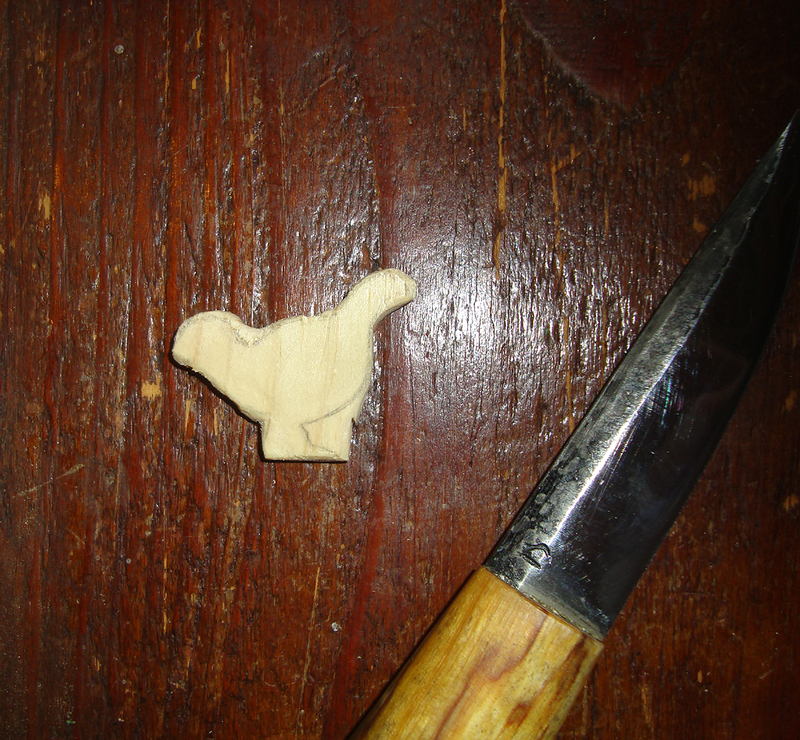 After carving the back part of the bird I inspected the blade and found confirmation to what I already felt during work: the central part of the edge was slightly rolled. I partly restored it with some stropping on black compound then completely restored it with few licks of ceramic stick. 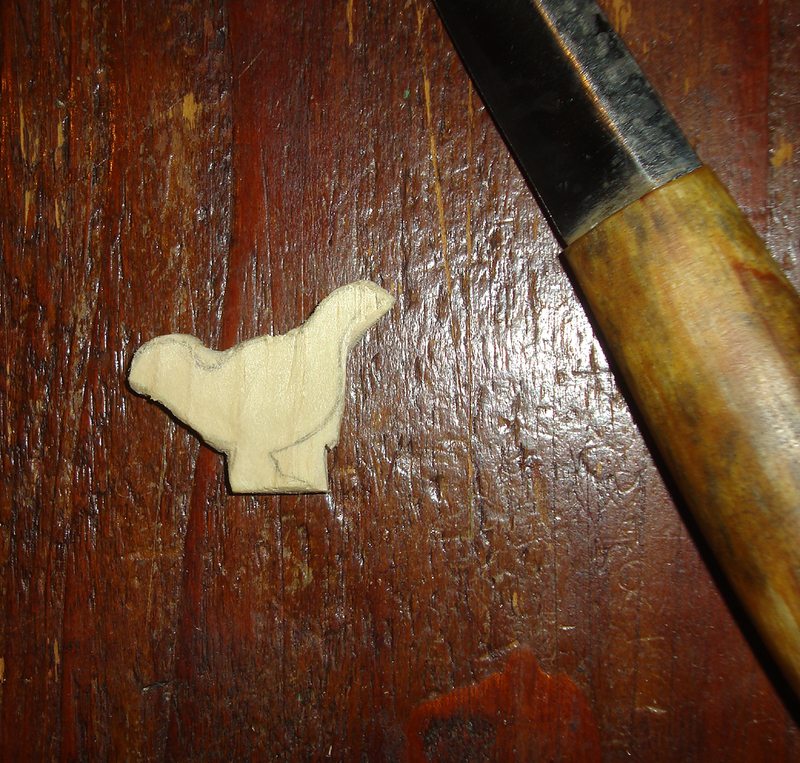 This done I proceeded to carve the head of our ptarmigan. This went absolutely nice and clean. I sawed off the last two bits of wood and went to work on the breast, belly and front of tarsiers. After having carved the beak, the chest and having roughed out the final shape of the legs I touched up the blade again with the ceramic stick to put the bite back. 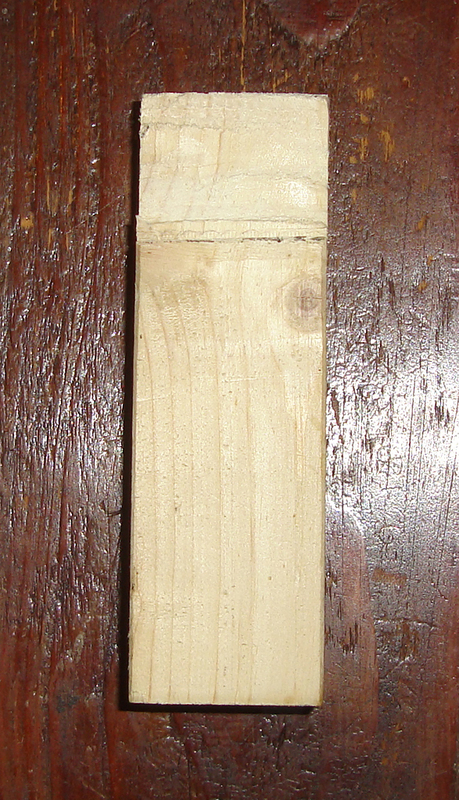 The edge didn’t show rolling or wear anymore, it just lost some bite due to the hardness of wood. Then I finished to shape the legs and refined the all bird. To conclude I gave it a bit of sandpaper and few more refining cuts when needed. I wasn’t able to detect any rough spot all along the carving. The handle, despite being thin, is comfortable and absolutely secure, allowing a really quick and intuitive control over the blade. I had to touch up the blade twice during the all process, but I was positively impressed with its strength. 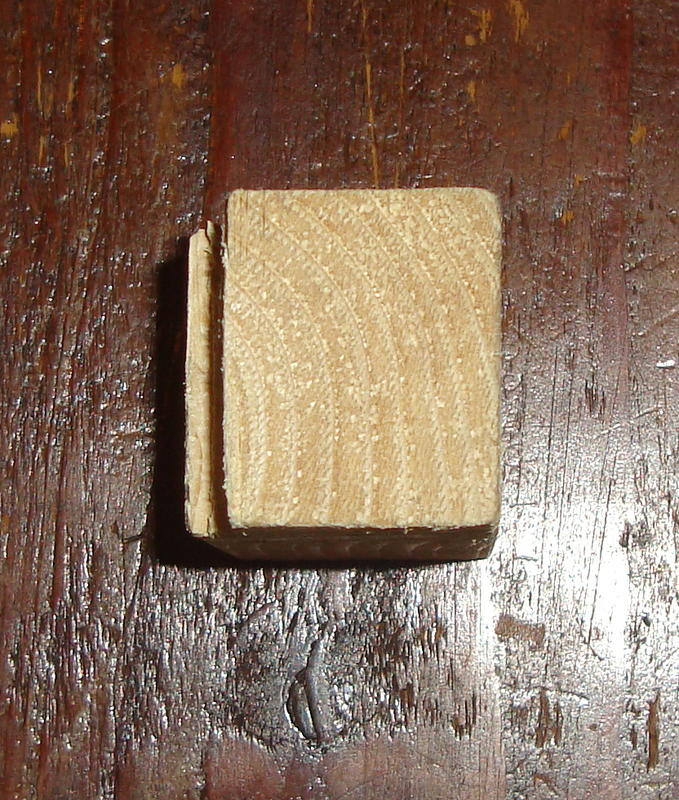 Keep in mind this is a 16° edge, the wood was hard, but above all, I always carved against perpendicular fibers. 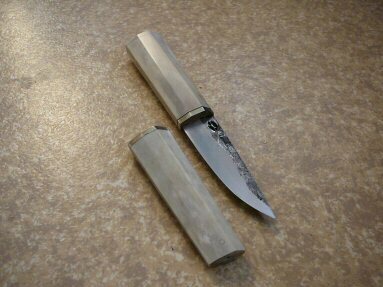 At the very end of my work the puukko is still plenty sharp and ready for another round. Being narrow, tapered and not that thick it proved not surprisingly to be extremely agile in detailed whittling, keeping enough mass for the power cuts needed in the first stages of rough shaping. I have to say the blade’s rhombic section was perfect for tiny spaces: a flat section blade hasn’t that quickness nor can achieve that preciseness due to its very geometry. 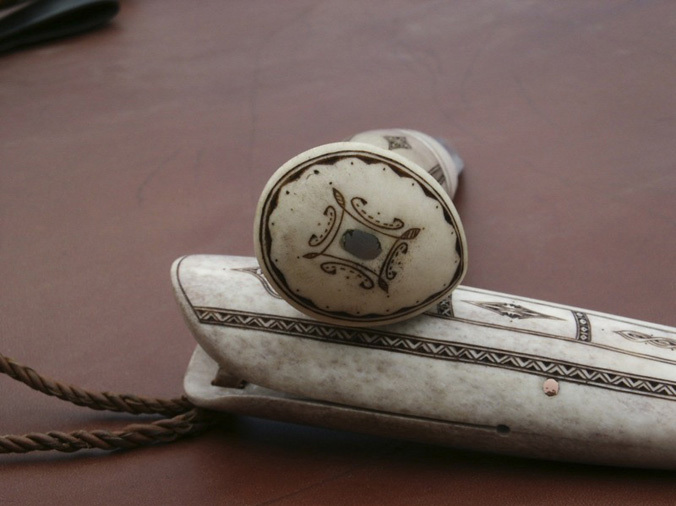 Pasi Jaakonaho is a puukkoseppämestari– a master smith, and teacher in Inari in Northern Finland, whose beautiful traditional knives evoke the spirit of the north. 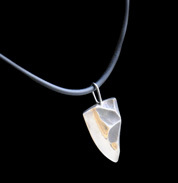 He is a craftsman who also works in wood and antler and makes silver jewelry. I hope you’ll enjoy this post, you can visit his website at http://www.pasijaakonaho.fi/linkit.htm to see more of his work or to contact him. 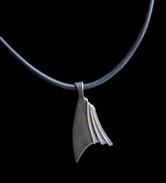 “I got the first push towards handcrafting in 1993, when I left to go Inari in northern Finland to study as artisan. 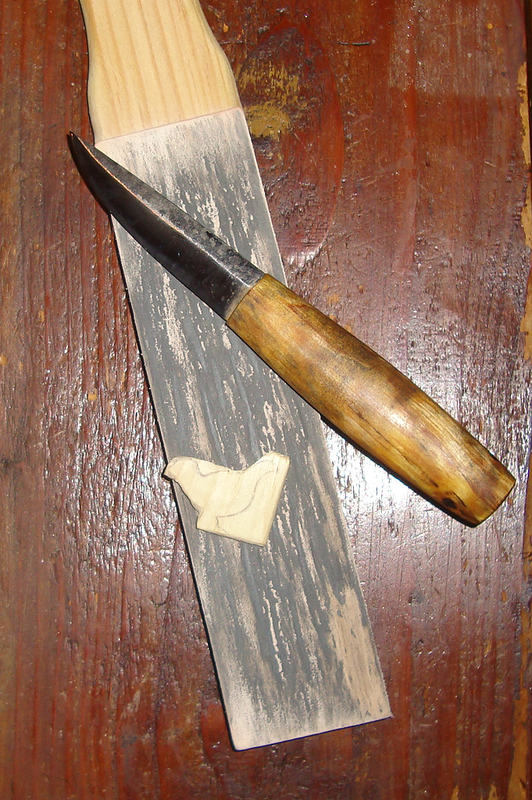 One of the areas of studies was puukko making. It was mainly about making traditional Sami puukkos. In my close family I don’t have craftsmen in particular, except Juho Jaakonaho who was well known maker of wooden skis. I was born in Pohjois-Pohjanmaa (northern Ostrobothnia), in small place called Oksava of Haapajärvi. It is a rural area, and it was normal there, that in every house they did some handcrafting. I worked as full time knifesmith in 2001-2004. My shop in Simo was built in 1920. 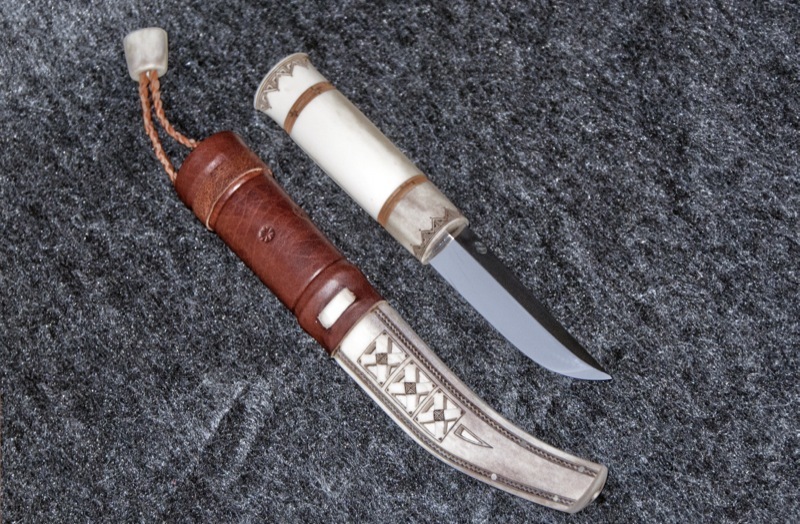 My main product were puukkos and puukko blades. I did a little bit of of other forging work too and also I worked with bones and antler, wood and burl. Also I made some fishing lures. Most part of learning I learned from making the puukkos, but I also had many teachers. To mention: Ilmari Laiti, Arto Saijets, Kari Pakarinen, Heino Tuomivaara. Currently I work in Inari in the Sámi Education Institute teaching forging, stag/woodworking and silverwork. www.sogsakk.fi Making puukkos is kind of a side-job. 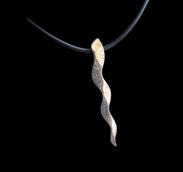 I have made more and more silver jewelery lately.